November 11, 2010 - During approach to Laredo, Texas, on Tuesday, a Boeing 787 Dreamliner on a test flight, airplane ZA002 lost primary electrical power as a result of an onboard electrical fire. Backup systems, including the deployment of the Ram Air Turbine (RAT), functioned as expected and allowed the crew to complete a safe landing. The cause of the fire is still under investigation by Boeing. Initial inspection appears to indicate that a power control panel in the aft electronics bay will need to be replaced on ZA002. Boeing reports they are inspecting the power panel and surrounding area near that panel to determine if other repairs will be necessary. 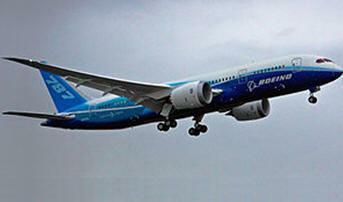 Boeing has retrieved flight data from the airplane and is analyzing it in Seattle. This process will take several days. The team was conducting monitoring of the Nitrogen Generation System at the time of the incident but there is no reason to suspect that the monitoring or earlier testing of that system had anything to do with the incident. ?Consistent with our internal processes, until we better understand the cause of the incident on ZA002, we have decided to postpone flight test activities on other airplanes. Ground test activities will be conducted until flight test resumes. ?Likewise, we cannot determine the impact of this event on the overall program schedule until we have worked our way through the data. Teams have been working through the night and will continue to work until analysis is complete and a path forward is determined.? The Boeing 787 Dreamliner is a long range, mid-sized, wide-body, twin-engine jet airliner developed by Boeing Commercial Airplanes. It seats 210 to 330 passengers, depending on variant. Boeing states that it is the company's most fuel-efficient airliner and the world's first major airliner to use composite materials for most of its construction. The 787 consumes 20% less fuel than the similarly-sized Boeing 767. Its development and production has involved a large-scale collaboration with numerous suppliers. Originally scheduled to enter service in May 2008, the aircraft's maiden flight took place on December 15, 2009, in the Seattle area and is currently undergoing flight testing with a goal of receiving its type certificate in late 2010, and to enter service in 2011.